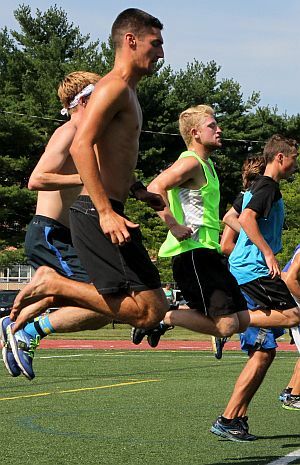 GTD: You trained in the GTD XC program this past summer. Was this your first time training with Coach Braz? Riley: My first time training with Coach Braz was the summer before my freshmen year of high school. I trained in the All-Sports summer program in order to get in shape for soccer. That winter, I began the first of four years running under Coach Braz on the track team. I trained in the Al-Sports program for one more summer before starting the Cross Country Program after I decided to run cross country. Riley: Having trained with Coach Braz for four years, the program had the same intensity and structure that I always expect from it. With that said, Coach Braz always finds new exercises and drills to keep improving us. GTD: As a college runner, you may have had a summer program from your college coach. How did you and Coach Braz make this work? Riley: Coach Braz made it easy to accomplish the summer program from my college coach. He understands that with college runners, our primary goal is to follow our coach's program. Once I got my program, I forwarded it to Coach Braz and every week he would communicate with me on how my week of training would play out. Majority of the time, the workouts my college coach planned for the week would match up with what Coach Braz had planned for the training sessions. If not, Coach Braz would accommodate me and have my specific workout set up. Executing the program from my college coach was made easier just by being at the program because it gave me people to train with and the motivation to do exercises that I might not do on my own. GTD: The last phase of each conditioning session this summer was devoted to core work, flexibility, and strength. Tell us about it. What did you like and didn't like. Did feelings about this phase change over the length of the program? Riley: Having trained with Coach Braz for four years, I have grown to love and understand the benefit of core work, flexibility, and strength. Although they can be uncomfortable and hard at times, they definitely enhance training in a way that simply running more miles can't do. For core work, we do a lot of exercises such as planks and 6-inches. This year, a new exercise and one of my favorites was medicine ball work. Coach Doyle organized these workouts and I felt they were a welcome and more active change from the normal core exercises. For flexibility, we do a lot of stretching. Coach Pete will teach stretches that are beyond any stretch you have ever done. On top of that, we do a lot of hurdle work. I have a love-hate relationship with hurdle work but in the end, they are very important for hip flexibility. To improve strength, we often work with bands. Riley: The biggest things I have learned from this program and Coach Braz is to be patient with summer training and to never forget about the little things like core and stretching. Riley: My fall xc season went very well. The training in college was definitely very intense but I felt that Coach Braz's program prepared me well for it. The jump up to an 8k race was not as drastic as I expected and after one race, it became normal. I was in my team's top 7 and we finished second in our conference and third in the region. This past weekend we competed in the NCAA Division 2 Nationals in Joplin, Missouri. GTD: Are you running winter and/or spring track? Riley: Yes I will be running both winter and spring track at Stonehill. Riley: Right now I am still undecided on a major. 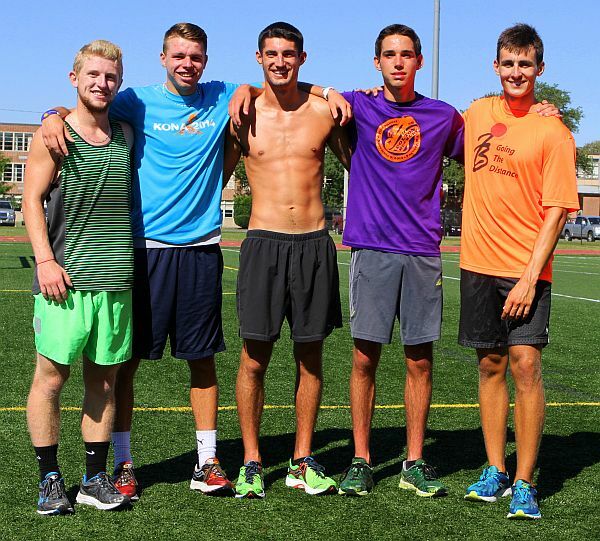 Five of the college athletes in the GTD XC program, summer of 2015. Riley Dowd (Stonehill), Jason Karakaedos (UMass/Dartmouth), Eric Loehle (BU).